For SCADA and automation applications, MQTT allows you to send commands to devices and to read and publish data from (sensor) devices. 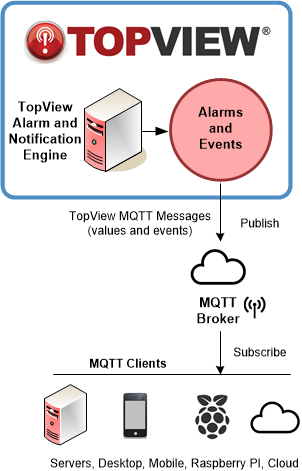 Although TopView can monitor sensor data and events from MQTT messages as a subscriber (TopView for MQTT), all versions of TopView (TopView OPC/SCADA, PI, SQL, …) support publishing MQTT messages for TopView events and monitored values. MQTT publish allows the user to configure the topic and payload for each published message using any of TopView’s message placeholders. TopView also includes a test MQTT broker that can assist with testing of your published TopView MQTT messages.